Smoke and fumes from coal-fired power plants make us ill. They are responsible for hundreds of thousands of deaths worldwide each year. Atmospheric and environmental pollution from coal costs billions in health expenses. A chapter from the Coal Atlas. 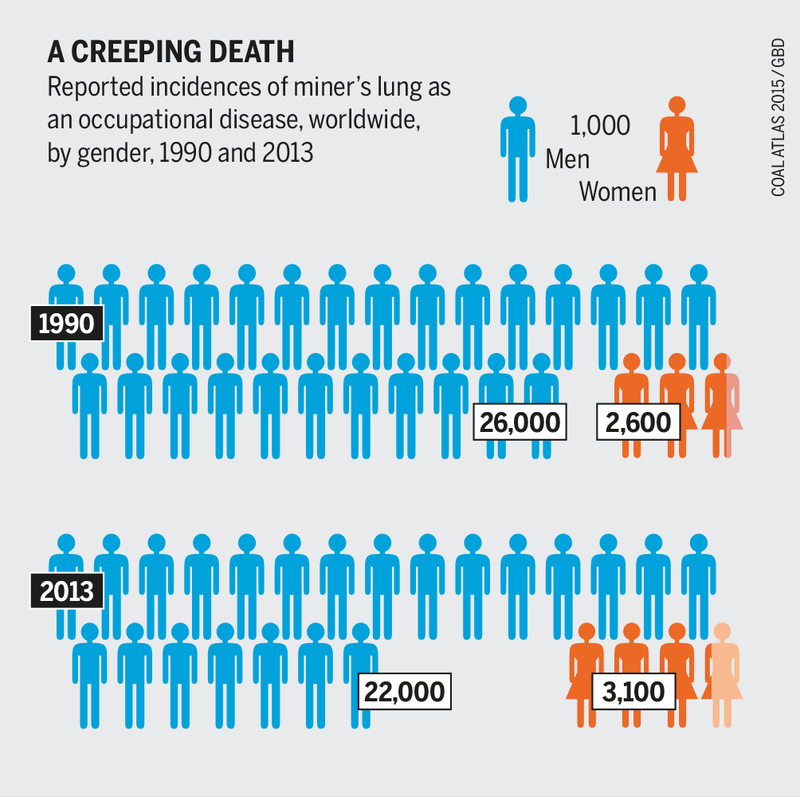 Mining and burning coal harm human health both directly and indirectly. The European Pollutant Release and Transfer Register, a database of emissions, lists 53 pollutants released by coal-fired power stations into the air, water, and the soil. Burning a kilogram of hard coal, releases more pollutants than burning a kilogram of lignite. But then again, you need three times as much lignite to produce the same amount of energy. That is why lignite is regarded as the dirtier fuel. According to the World Health Organization (WHO), air pollution is one of the major health risks. In 2012, the WHO estimates that worldwide, 3.7 million people died prematurely as a result of diseases attributed to outdoor air pollution. The smog in Asia’s cities is caused mainly by vehicle exhaust and burning coal. Estimates of the number of victims worldwide due to coal-fired power vary widely. A study conducted by the Chicago School of Public Health reveals that coal combustion in China accounts for 250,000 deaths per year in the country. The researchers base this number on an estimated 77 deaths per terawatt hour from a coal-fired power plant. 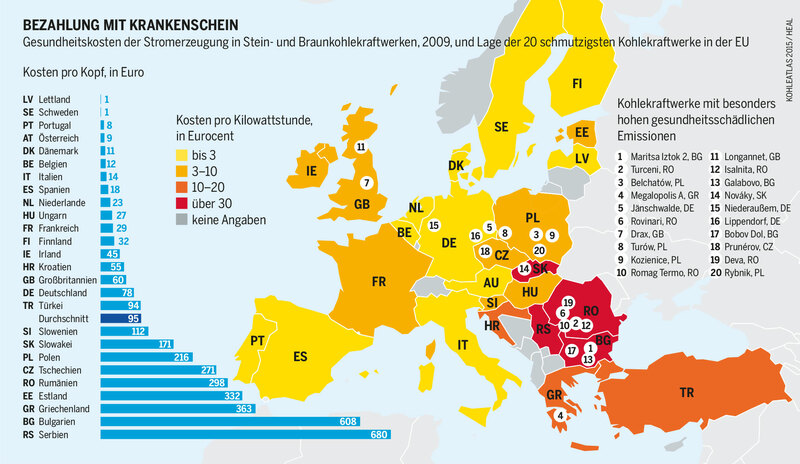 Detailed figures for Europe come from the Health and Environment Alliance (HEAL), a coalition of 65 European non-governmental organisations. 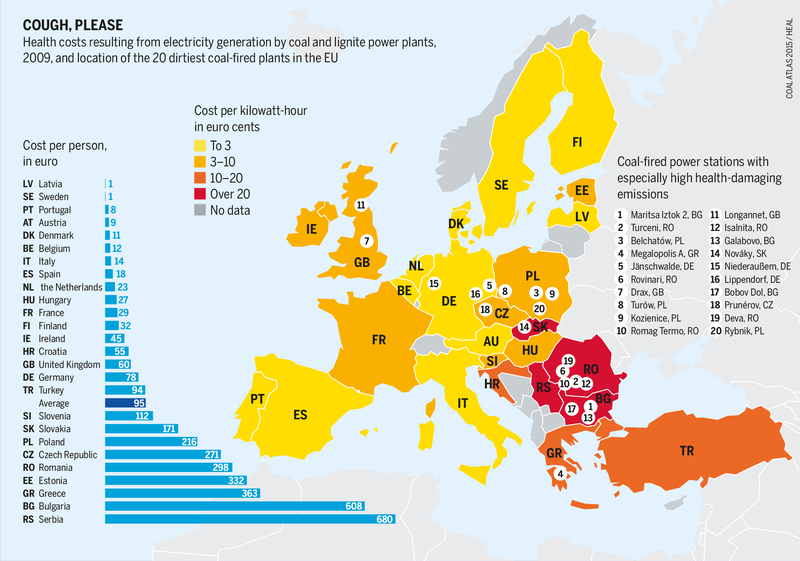 They blame coal power for 18,200 deaths in the European Union annually. The coalition says that 8,500 people are diagnosed with chronic bronchitis a year because they come into contact with pollutants from coal plants. 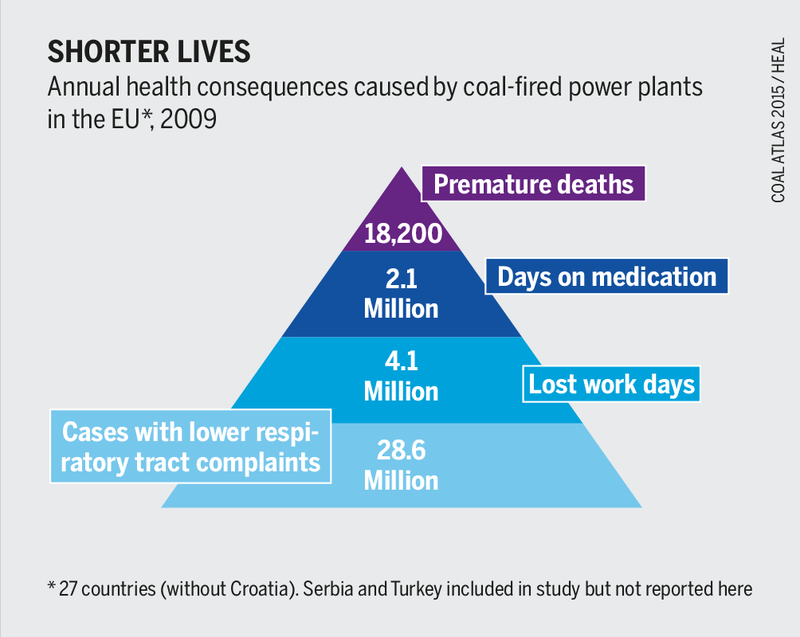 If power plants in Croatia, Serbia and Turkey are included, the number of deaths in Europe rises to more than 23,000 a year. 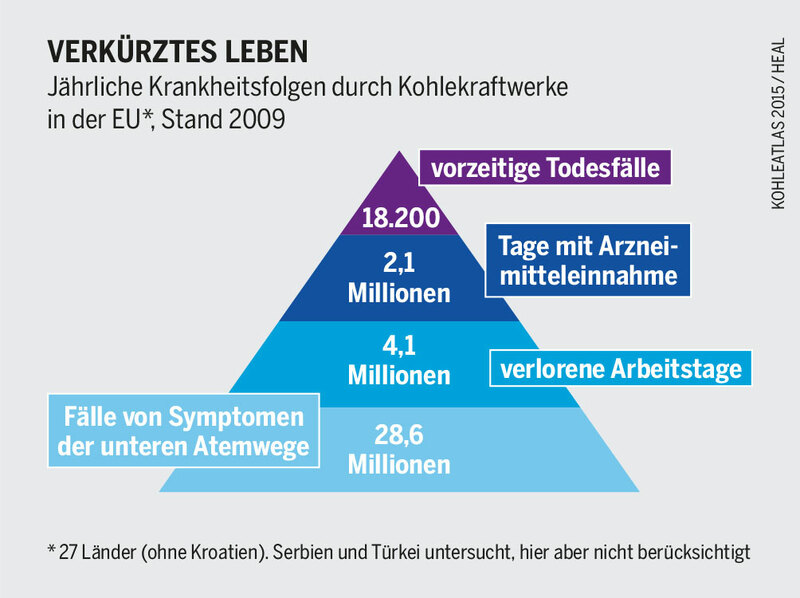 HEAL calculates that the health costs add up to almost 43 billion euro a year. These high health costs ought to be included when comparing the prices of various sources of energy. The amounts of emissions depend on the filtering systems the power plant uses. Although these have improved considerably in recent decades, coal-fired plants are still responsible for releasing 70 percent of the EU-wide emissions of sulphur dioxide – a particularly important class of fine particles – along with half of the industrial mercury emissions. When fine particles are inhaled, they penetrate the lungs and bloodstream, causing various harmful effects on the body. They can cause chronic inflammation of the lungs, impair the pulmonary reflexes, and reduce the functioning of the lungs. That can lead to diseases such as asthma, chronic bronchitis, and in the long term, lung cancer. Another effect is reduced blood flow to the brain because the blood coagulates faster and can carry less oxygen. High blood pressure, irregular heartbeat and heart attacks may result. There is no official limit below which fine particles are considered harmless. Children are especially susceptible to the harmful effects of heavy metals in emissions: lead, mercury, cadmium and arsenic. If their lungs are damaged early in life, they may be permanently weakened. While still in their mother’s wombs, children who are exposed to large amounts of lead or mercury risk developing cognitive disorders and often have lower IQs. They may also suffer irreversible organ damage. Measurements show that power stations with especially high carbon dioxide emissions also emit many other toxic pollutants. If less CO2 is released, the emissions of sulphur dioxide, nitrogen and fine particles also fall. That is why the American Lung Association supports President Obama’s climate change plan, which aims to reduce the emissions from new power stations by around one-third. But the burning of coal is only one health hazard; mining is harmful too. People living near open-cast mines are exposed to high levels of particulate matter, which can lead to respiratory diseases or allergies. Mine tailings contain heavy metals and other toxic substances that can enter the groundwater and air. Radioactivity is another problem. Lignite contains uranium, thorium and potassium-40. In the Rhineland, Germany’s largest open-cast mining area, 100 million tonnes of lignite and 460 tonnes of overburden are excavated each year. Friends of the Earth Germany estimates that this includes 388 tonnes of uranium. These radioactive substances are also present in the airborne dust and find their way into people’s lungs – with incalculable consequences to their health. that coal is responsible for half of the deaths caused by respiratory and cardiovascular diseases in the region. 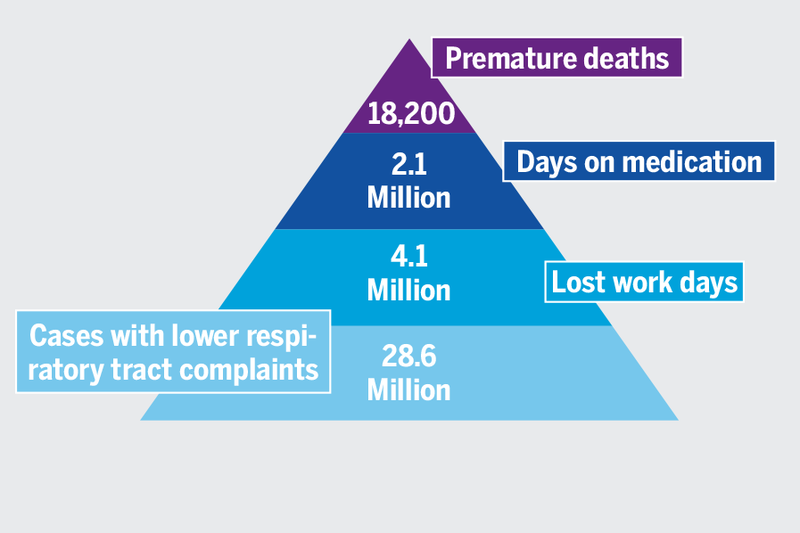 Respiratory problems such as asthma and whooping cough are widespread among local people. Children and elderly people are especially at risk. Most of the power plants do not have to comply with national clean air standards – for cost reasons. The permissible limits for pollutants vary widely from country to country. The United States has significantly stricter mercury and sulphur dioxide limits than the European Union. As a result, many coal-fired power plants there have been closed or retrofitted. Climate change caused by using coal is an indirect threat to human health. In June 2015, a Lancet Commission of international health experts warned about the health consequences of global warming. The last five decades of development and health advances could be nullified. The commission pointed at the dangers posed by air pollution, rising temperatures and extreme weather. This included increasing heat stress, the spread of infectious diseases such as malaria and dengue, threats to food security, malnutrition, and a rising number of refugees and armed conflicts.